Restoring and repairing an antique chair is not a job to be taken on lightly, and it is not the intention here to offer instructions on how to carry out the restoration of an old chair. However, certain repair jobs are not always as difficult as most people believe them to be, and here is some advice to keep in mind when considering whether or not to tackle what at first sight might appear to be difficult restoration jobs. What is an Antique Chair? First, we have to define the meaning of the term ‘antique’. This definition changes according to the country you live in or the type of article we are discussing. In the USA, for example, the U.S. customs used the Tariff Act of 1930 to define an object manufactured prior to 1930 as being an antique. That is believed to be because mass production began after that date. However, take that definition to Europe and they will scratch their heads at that and claim that an antique chair is one over 100 years old. That would appear to make more sense, since it then permits items to become antiques at a certain age – just like me! Some items become antiques at 50 years, and there are other definitions besides these. Nevertheless, let’s use the term ‘antique’ to mean ‘old’ for our present purpose, and discuss some ways in which relatively untrained people can restore their own antique chairs and sofas. Restoration and repair can cover anything from complete reupholstery from the frame up to replacing missing casters. 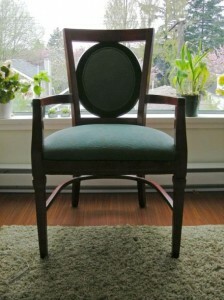 Here are some of the more common repairs needed on antique chairs. 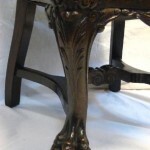 Among the more common problems with an antique chair that would involve a repair or even restoration are the aforementioned missing casters, damaged varnishing, torn upholstery and damaged springs. Each of these can be resolved with a little knowledge, although it would likely take a skilled craftsman to return the chair to its original state. Casters come in sets of 4+. What that means is that if one is missing, as frequently happens, then it is unlikely that you will be able to source a single caster of exactly the same design. In order for your antique chair to look right, it is better that you purchase a full set of casters rather than ‘make do’ with one that approximates the other three in appearance. You can purchase genuine antique caster sets, often of the same period as your chair or modern casters that are designed to look like antiques. First you have to remove the old casters: this is often simply a matter of using a large screwdriver to pry the casters from their sockets, although if the new sockets are larger than the old ones, you may have to drill new wholes for the new sockets. Some of the newer old chairs have caster sockets, or even the entire caster, that are screwed onto the under-frame. For those with sockets, simply drill the hole of the correct size, tap the sockets into the legs of the chair and then press or gently tap the new casters in. You will find it fairly easy, although you have to make sure that when you purchase them, the sockets of the new casters are not smaller than those of the ones they are replacing. It is easier to bore new larger holes than it is to fill in the old and then create smaller holes. Antique chair legs tend to get damaged first, before any other part of the chair, and also the arms and back if the chair is not fully upholstered. Whether it is necessary to remove the upholstery first or not, the following is the way to re-varnish the woodwork. First remove the old varnish: a good thick gel paint remover is best. Brush it on fairly thickly, and make sure you don’t miss any. Leave it until the varnish softens and starts to blister, then scrape it off. It should come off easily without excessively hard scraping, and a putty knife should be enough – never use a sharp table knife or you will be liable to cut into the wood and cause damage that will be expensive to restore. Then use steel wool to remove the remaining varnish. Finish off using a fine sand paper, and according to the type of wood, apply a spirit-based wood stain or just a clear or stained varnish. Water-based wood stains can be used, but they tend to raise the grain of the wood and you might then find you have to sand it down again for a smooth finish. Use either a satin or gloss varnish to finish off, depending upon the look you are trying to achieve. Ordinary resin-based varnishes can be used, but if you want to remain traditional then use a spirit-based shellac varnish. The key to restoring and repairing an antique chair is to take your time, make sure you know what you are doing and try to be as faithful to the original materials and colors as you can. Missing casters and damaged legs are just two common problems you will find with old chairs, whether they are officially classified as antique or not. There are other problems, and while replacing or repairing broken wooden parts and reupholstery are more specialized, you can do it yourself if you learn how. 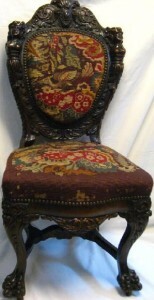 Click here to Shop for antique chairs in Central Kentucky!